Even though I’ve been an empty nester for quite some time, I still remember the hectic weekday nights of driving to kids’ activities and trying my best to serve a healthy meal to my brood. These days I enjoy experimenting with new recipes but I know many of us just don’t have the time for such luxuries! The other night I was short on time so looked in the fridge to see what I had: lots of leftover bell peppers from some veggie rolls I’d made, a package of organic kale-balsamic chicken sausages, a sweet potato and an onion. I always have salad ingredients on hand; we eat a LOT of greens in this house. The dinner was so easy to make and really tasty so I thought I’d share with you crazy-busy people! Heat the oven to 400º. Place sweet potatoes on a baking sheet. Add 1/2 – 1 tablespoon of olive oil and mix to coat. Spread out in a single layer and sprinkle lightly with salt and pepper. Bake for 15 minutes then move the potatoes around with a spatula. Cook for another 5-10 minutes. Watch carefully to avoid burning. Remove from oven when cooked through and slightly golden on edges. Lower oven temperature to 350. Place sausages in a glass pie dish or other container big enough to hold them all. Cook for about 20 minutes, checking halfway through to rotate. Remove from oven. While the sausages are cooking, heat a tablespoon of olive oil in a large skillet over medium-high heat. Add the onions and peppers and cook, stirring often until soft, about 10 minutes. Place sausages in the center of a large platter. Serve them whole or cut into smaller 1″ pieces. 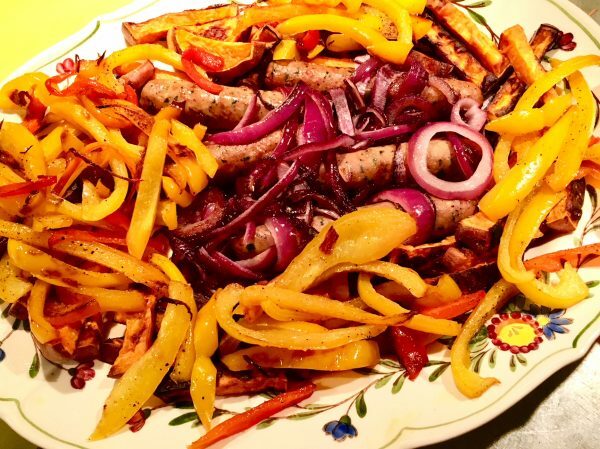 Make a circle around the sausages with the onions and peppers then add the sweet potatoes to complete the plate. A nice presentation adds a little fun to the meal! Don’t forget to make a big salad to accompany your main dish. Add lots of greens, halved cherry tomatoes, 1/2 avocado cut into chunks, thinly sliced red onion and even a few red grapes for a bit of sweetness – enjoy! This really turns an ordinary salad into a satisfying main dish. What I really love is the creaminess of the avocado against the hot sausage/peppers mix!